If you own a light truck or SUV and use it extensively for driving on varied terrains then you should take a look at Michelin LTX A/T 2 tires. Michelin is known for its wide range of light truck tires and uses advanced technology to build tires suited to your purpose. Michelin has used its latest MaxTouch Construction which brings you a longer lasting tire due to its special tread design. It features a unique tire footprint shape, and the latest technology ensures there is even wear on the tread to prolong the life of the tire. The use of an advanced tread compound in the LTX A/T 2 has resulted in excellent traction on varied surfaces. The tire delivers grip on muddy surfaces, gravel, sand, dirt and snow. The tread is supplemented by an independent tread block design which features Michelin’s Biting Edge Technology This further assists traction on different kinds of surfaces. The tread has notched blocks which result in good grip in various off-road conditions as well as on the highway. One thing that may surprise you with this model is in how quiet the tire is. In fact it is one of the quietest tires in its class. The reduction in noise has been made possible by Michelin’s Comfort Control Technology that also reduces vibration thereby bringing you a noiseless ride. The tire handles very well and drivers have been impressed by its handling qualities. Inside the tire Michelin has incorporated two steel belts which have been supported by an additional third belt for enhanced support to the tire. It provides added strength and durability. Michelin offers a choice of black or white lettering on the sidewall depending on the tire size. Overall the Michelin LTX A/T 2 tire is a one of the best tires in its class. Traction and handling on all types of terrain, and in all types of road conditions, is excellent. The ride is comfortable and the value for the money that this tire provides is superb. Here you can find Michelin tire rebates so try to get the best possible price. Or try other tires discounts here. Prices for the Michelin LTX A/T 2 range from around $160 for the 15 inch series tires to approximately $350 for the larger 20 inch series tires. Who Are Michelin LTX A/T 2 Tire Designed For? 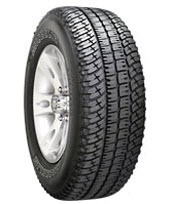 The Michelin LTX A/T 2 is designed for drivers of for minivans, pickups and SUVs who are seeking an all-season, all-terrain tire that provides excellent traction on different kinds of surfaces, as well as a comfortable and surprisingly quiet ride. Michelin backs up the LTX A/T 2 with a 6 year or 60,000 mile treadlife guarantee. (Michelin provides half mileage warranty for rear tires if front tires are different size) Tire uniformity is for one year or the first 2/32 inches of wear. Materials and workmanship are covered for 6 years and include free replacement for first year or the first 2/32 inches, or 25% of wear. Michelin prorates the remaining time period down to the final 2/32 inch of useable tread on the tire. You also get a 30-day satisfaction guarantee and a 3-year flat tire changing service.